With a 20" mast and a 1" diameter this is the ideal Antenna J-Pole for the HD-2605 Ultra, HD-2805 Ultra, HD-8000 and HD-8008 Outdoor TV Antenna's. Mount it on the Eave, Mount it on the Roof, Mount it on the Deck Railing, this is truly a Universal Outdoor TV Antenna Pole that comes with all the hardware needed to easily install your new TV Antenna. 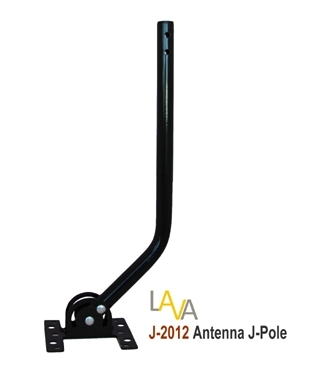 With the J-2012 Antenna J-Pole Pivoting Foot you are able to mount the pole on almost any angle and still be able to stand the pole up straight. This TV Antenna Mounting Pole is also good for most of the the outdoor Antenna's on the market today. 20'' J-shaped 1'' diameter mounting pole with pivoting foot. Mounting bracket Expansion bolts and Screws. High Quality 100% Steel TV Antenna Pole. Black Glossy Finish J Shaped with Pivoting Foot for Easy Mounting, anywhere! Includes Mounting Bracket and all the Bolts and Screws needed. Thank you for your support and follow up which was other than the product, the main reason I purchased from you folks. I have installed it as high as I could go on my second story without having to do a roof mount. It was a snap! I will cut ties with my "cable provider" in a week an a half since I had to pay for one more month due to inclement weather. If I have any technical questions upon installation of the cable and TV hook up, I will certainly reach out to you . Regards, G. Alvarez- Auburn, CA. Sturdy and fit very well. Delivered quickly. This is the best thing I have ever ordered online! I am so happy with the product that I purchased 2 more for family members and they are very greatfull as well, would recommend this to ever!